W.S. Merwin puts a blueberry on the railing of his lanai for a cardinal that visits him every morning at his home in Peahi. Cardinals, doves, thrushes and other birds sing and flit through the forest filled with thousands of palms and other trees that engulf the renowned poet’s quiet and peaceful home. Mosquitoes arising from water in bromeliads and palms and pockets in the dry bed of the Peahi Stream buzz bomb and bite. Walking down the steep trail, partly formed on old pineapple furrows, 2,740 palms of all kinds fill the landscape, as many as 50 species visible at a glance. There are palms that shoot to the sky through the forest canopy. One has a fur coat to protect it from the Himalayan cold. Another has sharp thorns that may have helped fend off dinosaurs. The cardinal likely makes his daily visits because of the labors of the poet, not to hear his poems, but to fly through the magnificent forest Merwin meticulously nurtured from the Peahi scrubland he bought 40 years ago. The ecosystem was built palm by palm, using only hand tools. His wife, Paula, later joined him, planting the ground cover that helps the palms flourish and dresses up the brown Haiku clay. It is said the walking irises were in full bloom the day before she died in March. Merwin, who will be 90 next week, has made his mark in the world as one of the most decorated and respected poets of this generation. His words express and convey his feelings, philosophies, views of life and the world and so much more on the printed and now digital pages. His 18-acre palm forest, in which he wrote many of his poems, offers a tangible embodiment of Merwin and his legacy. The U.S. poet laureate and two-time Pulitzer Prize-winning poet no longer plants in his “garden” or makes public appearances. His palm forest, though, is open once a month by appointment to the public — the next one being Sept. 26 — and has been visited by schoolchildren and others on Maui. 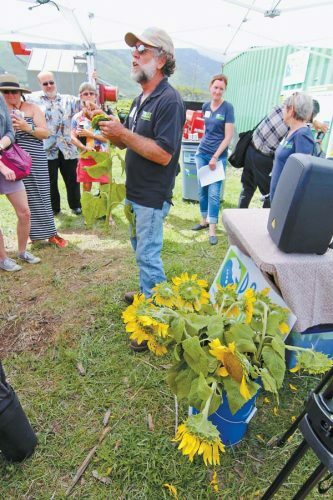 The Merwin Conservancy Communications & Outreach Director Sara Tekula and head gardener Olin Erickson gave The Maui News a tour of the forest and Merwin’s home Wednesday. 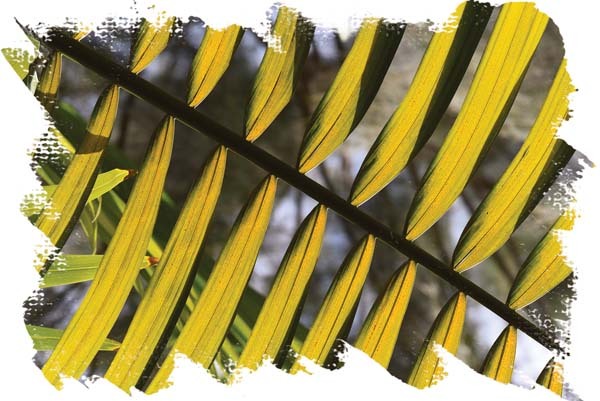 The Merwin Conservancy, established in 2010, is involved in the management, maintenance and expansion of the Merwin Palm Collection in partnership with the Hawaiian Islands Land Trust. The conservancy also works in partnership with Copper Canyon Press, the nonprofit publisher of Merwin’s poetry, to advance the poet’s literary legacy and his goal to create a Merwin Fellowship program to support poets, writers and artists. The conservancy has begun laying the groundwork for an artists-in-residency program that would use the two-story cedar home with a loft in the forest. The artist might be a lecturer in the conservancy’s “Green Room” series, which brings lecturers to Maui, and now Oahu, said Tekula. The conservancy’s upcoming Green Room is a 90th birthday event for Merwin at 7 p.m. Sept. 29 at the Maui Arts & Cultural Center’s McCoy Theater. Poet Edward Hirsch, president of the Guggenheim Foundation, and Michael Wiegers of Copper Canyon Press, Merwin’s longtime book editor, will be among the guests. Tickets are $25 per person with a $10 student rate. Proceeds benefit the conservancy. The board of directors of the conservancy, headed by Paula’s son Matthew Schwartz, has begun looking at master plans for the 18 acres. Merwin originally purchased 3 acres in 1977, and in 1986, according to property tax records, he bought two adjoining properties totaling 15 acres, including the upper bed of the Peahi Stream. The western side of the property above the sloping valley remains as it was, probably similar to the conditions Merwin faced when he embarked on his effort to revive this small piece of earth. A Cook pine towers above the forest near the access road. Palms mostly grow in Merwin’s forest but there are remnant trees like ironwoods and mango as well as native hala. But it was the pine that offered a point of reference to the former Midwesterner hired to remove an invasive plant from the forest 15 years ago. The head gardener owned a landscaping business with his brother and was hired to remove an invasive plant Merwin had received as a gift. Erickson has worked the forest, ever since. Currently, he tends to palms and other plants two days a week with another gardener and a small crew. “This is a part of who I am,” Erickson said. “For me, it’s a real privilege and blessing to be able to work here in this garden. It’s taught me so much that I can’t imagine it not being a part of my life. There are many who are likely envious of the head gardener, being so close with the literary icon. Erickson said he didn’t know of Merwin’s fame when he took the job. “I think that was a good thing because I might have been intimidated otherwise,” Erickson said. “I know people that are ‘he’s just so famous,’ and it’s a bit intimidating. So when they meet him for the first time or something it’s like meeting a movie star. “I know William the gardener more than I know William the poet. And that’s kinda always been our relationship. We talk about the garden. We talk about dogs. We talk about life. And we really haven’t had that many conversations about his poetry. Kinda kept that separate. “Certain people get put on pedestals and everything but I know him as just William,” he said. Tekula noted that a lot of Maui people know Merwin as “the guy down the street who grows palms,” and he has said that he likes it that way. The palm forest grows on land that once held koa, sandalwood and ohia, and the Peahi Stream flowed to the Pacific Ocean. The trees were cut for their wood and replaced by pastureland. 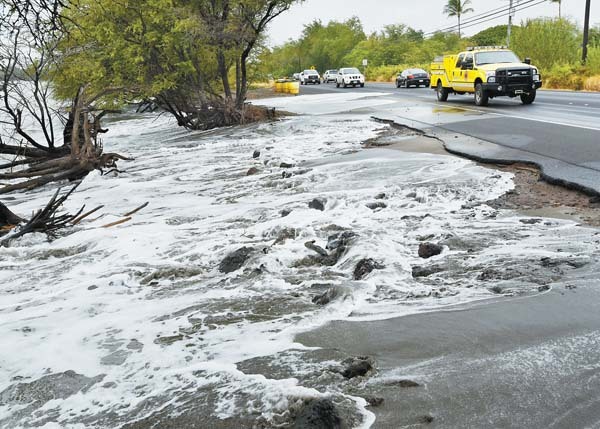 The stream was diverted to provide water for sugar cane in Central Maui. Attempts to grow sugar cane and pineapple on the land proved unsuccessful and destructive to the soil. The poet initially attempted to restore the native forest but found the soil depleted of the nutrients that once fed the koa and ohia. Those native trees died, but the palms survived. 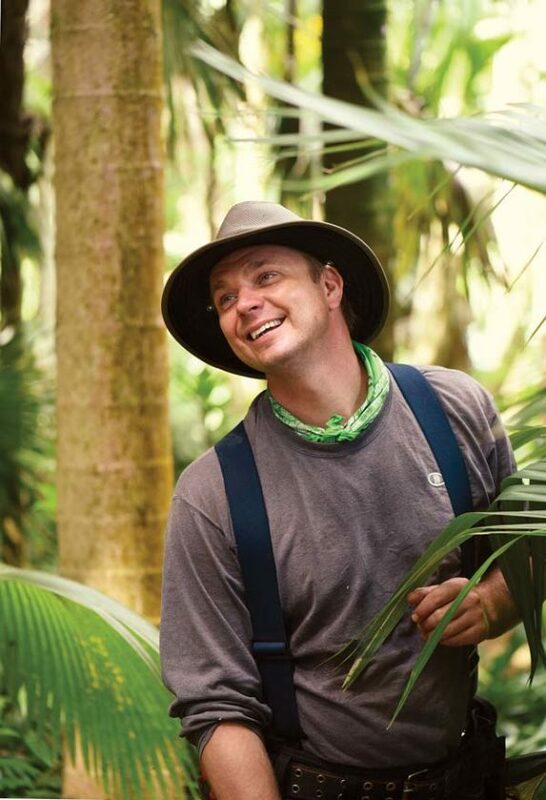 Palms “evolved in these jungle habitats where there is so much biodiversity and so much competition going on that they are true survivors,” Erickson explained. 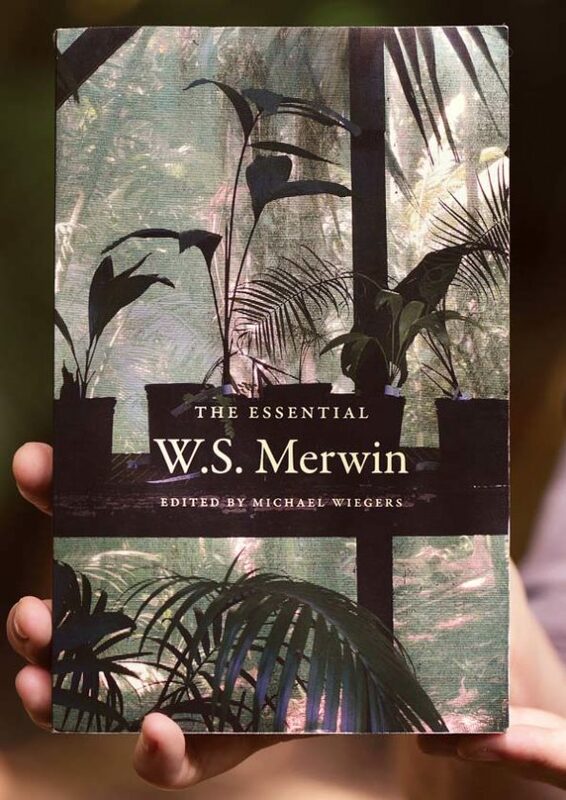 It really was kind of a jungle that Merwin attempted to grow palms in at first. “He would tell me stories of how he wanted to discover the land, but it was so overgrown with Christmas berry and java plums that he would be on his hands and knees crawling through it,” Erickson said. “Whenever I have a really tough day at work here, I think about not having your power tools, imagine crawling on your hands and knees with your handsaw,” Erickson said. Through the years, Erickson said he has learned much from Merwin and believes he has grasped the poet’s philosophy of gardening and life. Lastly, “you gotta care for it,” Erickson said. It’s how Merwin lived his life, he said. The poet would wake up in the morning, meditate, write until the later afternoon, come to the garden, work for a few hours and maybe plant a palm or two. In his gardening and his creative process, there are parallels. Like gardening, writing is “a daily practice and making sure it is built into your daily ritual,” Tekula said. “And whether something comes that day or not doesn’t matter. Whether you get successfully to that part of the garden you meant to get to that day doesn’t matter. It’s just this daily practice of having it be a part of your life. Many poems were written on this piece of earth. As Tekula says, when the creative “muse” would strike, he would stop to write it down on a piece of scrap paper or envelope for later use and continue what he was doing, even in the garden. Taking the long way around the property to the streambed and up the other side of the valley, the tour wound toward Merwin’s home. A steep rock stairway curved to the front lanai. When he selected the site for the home, halfway down the slope, he was reminded of a John Blofeld book on his travels in China in the 1930s and his account of visits to ancient Taoist and Buddhist monasteries. At a turn in the path, Blofeld would be taken by surprise by a monastery or temple suddenly coming into view “as if they had grown out of the mountain,” Merwin wrote. “What he was describing sounded to me like an ideal, and I hoped to have a house set among trees and visible only as one actually arrived there on foot,” he said. Merwin was advised to build on the flat area on the ridge for vehicle accessibility. In 1983 after his mother, Paula, married Merwin and the couple had relocated from New York to Maui, Schwartz came for a visit. 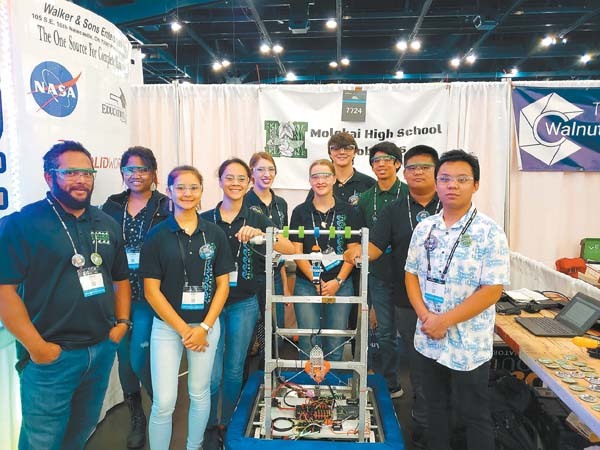 “My first surprise was discovering that William had built the small dark wood house with lanais wrapped around it down in the tree-choked valley, not at the top of the slope where there were views of the distant ocean,” he said in an email. “When I asked him why, he explained that this is how he believed ancient Hawaiians would have chosen where to build. Merwin built a pier-and-post structure to avoid the use of heavy machinery, wanting to keep the land as undisturbed as possible. Cement channels of water flow outside the railing of the covered front lanai, offering the calming splash and flow of a Japanese garden. But those water channels do more than offer a peaceful background, they are part of the home’s drinking water filtration system. Merwin put water catchment cisterns under each building, relying on his experiences living in a peasant village in France. The house is solar powered as well. “It is a great gift of fortune to have been allowed to live, as I have done for a great part of my life, in a place that I loved to begin with, and in a house that I myself designed and worked at building,” Merwin wrote in the Kenyon Review. 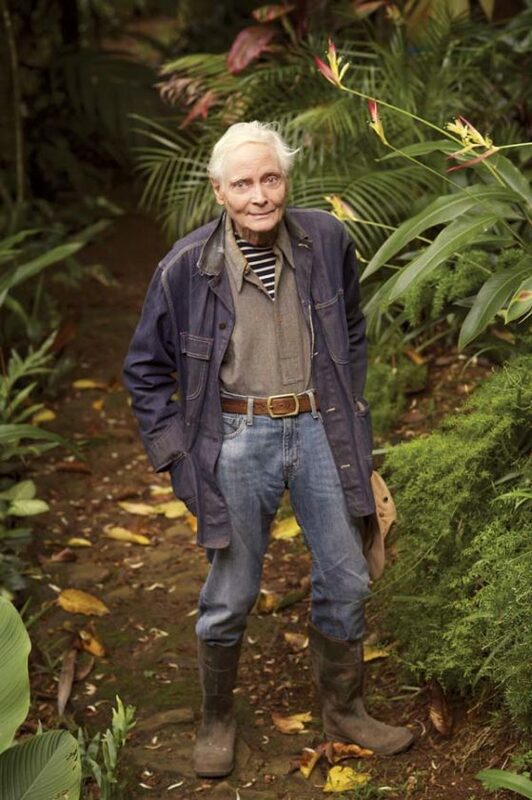 The conservancy will receive the home, land and palm forest when Merwin dies. The land is protected from future development by a conservation easement with the Hawaiian Islands Land Trust signed in 2014. That same year, the conservancy arranged for renowned palm expert John Dransfield of the Royal Botanical Gardens Kew to identify, tag, catalog and map each specimen in the collection. Merwin had not mapped the palm plantings and many of the labels had fallen away, Erickson noted. There are 400 taxonomic species, more than 125 unique genera and 800 different horticultural varieties. 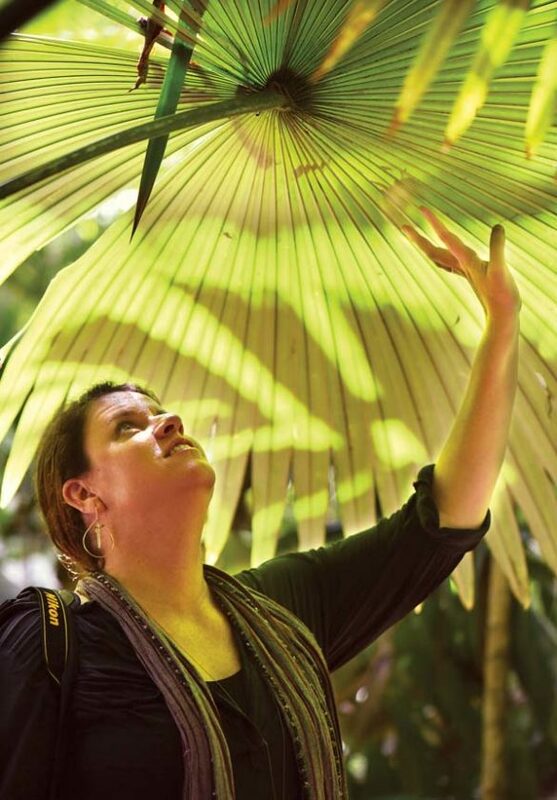 A scientific database has been created featuring detailed taxonomic information about each individual palm specimen, as well as its location within the forest using Global Positioning Systems and Google Earth technology. In January, the Merwin Palm Forest received a rare Hawaiian fan palm, Pritchardia glabrata, from Kahanu Garden. There are only 200 of these endangered palms left in the wild. Adding to the palm collection has gotten more difficult with more stringent import/export laws and concern about invasive species, Erickson said. Back in the day, Merwin obtained his palms and seeds by bringing them back from foreign places, from fellow collectors and Jeff Marcus with Floribunda Palms on the Big Island. As Tekula and Erickson guided the tour through the forest, everyone would stop from time to time as Tekula read a Merwin poem. Heads bowed in reverence. The prose melted into the humid midday air under the canopy of Merwin’s forest. It felt so right.